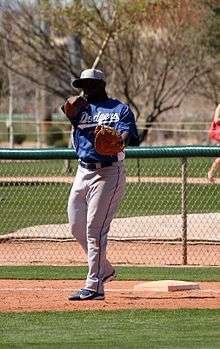 Yadier (Ventosa) Álvarez (born March 7, 1996) is a Cuban baseball pitcher for the Los Angeles Dodgers organization. Ranked as the second best prospect by mlb.com heading into the 2015 international signing period, Álvarez signed with the Dodgers on July 2, 2015, for a $16 million bonus. He made his professional baseball debut for the Dodgers Arizona rookie league affiliate on June 20, 2016 and struck out seven while only allowing one hit in 3 2⁄3 innings pitched. In five starts for the team, he was 1–1 with a 1.80 ERA and 57 strikeouts. He was promoted to the Great Lakes Loons of the Midwest League and struck out 10 in his debut for the Loons on July 21, 2016. He made nine starts for the Loons with a 2.97 ERA and 55 strikeouts in only 39 1⁄3 innings. Chris Anderson (born July 29, 1992) is a professional baseball pitcher in the Los Angeles Dodgers organization. The Dodgers selected him in the 1st round of the 2013 Major League Baseball Draft, and he signed with the team on June 12, 2013, for a signing bonus of $2,109,900. He made his professional debut with the Great Lakes Loons of the Midwest League on June 26, 2013. He made 12 starts with the Loons in his debut season, and was 3–0 with a 1.96 ERA. Anderson was promoted to the Rancho Cucamonga Quakes of the California League for 2014. In 27 games (25 starts) for the Quakes, he was 7–7 with a 4.62 ERA. His 146 strikeouts on the season was tops among all Dodger minor leaguers. The Dodgers invited him to attend major league spring training in 2015. He was assigned to the AA Tulsa Drillers of the Texas League to start the 2015 season and was named to the mid-season All-Star team. He made 23 starts for Tulsa and was 9–7 with a 4.05 ERA. He was promoted to the AAA Oklahoma City Dodgers in late August for a try out in the bullpen with the potential to be promoted to the majors in a bullpen role. He appeared in three games for them and allowed 15 runs in 6 1⁄3 innings and was not called up. He was given a non-roster invitation to Dodgers spring training in 2016. He returned to Tulsa to begin the 2016 season. He made 18 appearances with Tulsa (six starts) and was 3–6 with a 5.90 ERA before he was demoted back to the Quakes for the bulk of the season. With Rancho Cucamonga, he was 1–2 in 18 appearances and a 3.25 ERA. After the season, the Dodgers assigned him to the Glendale Desert Dogs of the Arizona Fall League. Bellinger was drafted by the Los Angeles Dodgers in the fourth round of the 2013 Major League Baseball Draft out of Hamilton High School in Chandler, Arizona. He signed with the Dodgers and made his professional debut with the Arizona League Dodgers. In 2014 he played with the Ogden Raptors and Arizona League Dodgers. He played in 2015 with the Rancho Cucamonga Quakes and was selected to the mid-season California League all-star team as well as the post-season all-star team. In 128 games, he hit .264 with 30 homers and 103 RBI. He was given a non-roster invitation to Dodgers spring training in 2016. 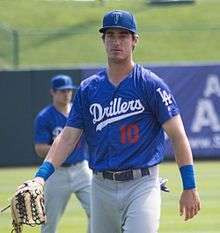 Bellinger was assigned to the Double-A Tulsa Drillers in the Texas League to start the 2016 season. In 114 games for Tulsa he hit .263 with 23 homers and 65 RBI, earning him a late season promotion to the Triple-A Oklahoma City Dodgers, where he had six hits in 11 at bats (.545 average) and three home runs. 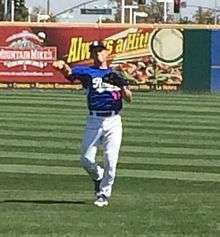 Bellinger was assigned to the Glendale Desert Dogs of the Arizona Fall League after the season and he participated in the Fall Stars Game of top prospects in the league. Willie Lamont Shawn Calhoun (born November 4, 1994) is an American professional baseball second baseman in the Los Angeles Dodgers organization. Calhoun was drafted by the Tampa Bay Rays in the 17th round of the 2013 Major League Baseball Draft out of Benicia High School in Benicia, California. He did not sign and attended the University of Arizona to play college baseball. After one year at Arizona he transferred to Yavapai College. He was then drafted by the Los Angeles Dodgers in the fourth round of the 2015 MLB Draft. He made his professional debut with the Ogden Raptors and was later promoted to the Great Lakes Loons and Rancho Cucamonga Quakes. In 73 games between the three levels, he hit .316 with 11 homers and 47 RBI. To start the 2016 season, he was promoted to the Double-A Tulsa Drillers of the Texas League. He was selected as a starter for the mid-season Texas League All-Star game and selected to the U.S. team for the All-Star Futures Game. At the conclusion of the season, he was also named to the post-season all-star team. In 132 games for the Drillers, he hit .254 with 27 homers and 88 RBI. After the season, the Dodgers assigned Calhoun to the Glendale Desert Dogs of the Arizona Fall League. He earned MVP honors in the Fall Stars Game for top prospects playing in the league when he went 3 for 3 with a homer in the game. Ralston Alexander Cash (born August 20, 1991) is an American professional baseball pitcher in the Los Angeles Dodgers organization. Cash attended Lakeview Academy in Georgia and was drafted by the Los Angeles Dodgers in the 2nd round of the 2010 MLB Draft. He played in 2010 for the Ogden Raptors and the Arizona League Dodgers. Major hip surgery ended his season early and caused him to miss the entire 2011 season. He returned to action with the Great Lakes Loons of the Midwest League in 2012, where he was 1–6 with a 6.42 ERA in nine games. In 2013, also with Great Lakes, he was 4–3 with a 3.19 ERA in 16 games (eight starts). He transitioned to the bullpen in 2014 where he was in 29 games for the Loons and another six for the Chattanooga Lookouts of the Double-A Southern League. He was 3–1 with a 2.90 ERA combined. In 2015, with the new AA affiliate, the Tulsa Drillers of the Texas League he was 2–6 with a 3.47 ERA in a career high 49 games. After the season, he played for the Glendale Desert Dogs in the Arizona Fall League and was named to the league's Fall Stars Game. He returned to Tulsa to start the 2016 season. He was 5–3 with a 3.00 ERA in 29 appearances for the Drillers and was then promoted to the Triple-A Oklahoma City Dodgers, where he was 4–0 with a 2.62 ERA in 17 appearances. After the season, the Dodgers assigned Cash to the Glendale Desert Dogs of the Arizona Fall League. Ralston Cash is the founder of the "Ralston Cash Foundation". Their mission is to help kids who have lost a parent to cancer in the previous year. De Jong started the 2015 season in Lansing, making 14 starts and posting a 7–4 record, 3.13 ERA, and 77 strikeouts in 86 1⁄3 innings. He was traded to the Los Angeles Dodgers on July 2, 2015 for cash. In 11 appearances (10 starts) for the Rancho Cucamonga Quakes he was 4–3 with a 4.86 ERA. He struck out six in six innings for the Quakes in the opening game of the California League championship series. The Dodgers invited him to major league spring training in 2016. To start the 2016 season, he was promoted to the Double-A Tulsa Drillers of the Texas League, where he was selected to the mid-season all-star team. After the season he was named to the post-season all-star team and honored as the Texas League Pitcher of the Year. In 25 starts for the Drillers he was 14–5 with a 2.86 ERA, earning him a late season promotion to the Triple-A Oklahoma City Dodgers, where he allowed one run in 5 1⁄3 innings in his one start. The Dodgers added him to their 40-man roster after the season. Yusniel Efrain (Hechavarria) Díaz (born October 7, 1996) is a Cuban professional baseball outfielder in the Los Angeles Dodgers organization. Díaz signed with the Los Angeles Dodgers in November 2015. The Dodgers assigned him to the Rancho Cucamonga Quakes of the Advanced Class-A California League to begin his professional career. In 82 games for the Quakes in 2016, he hit .267 with eight homers and 54 RBI. He was drafted by the Dodgers in the 12th round of the 2011 MLB Draft. He spent 2011 with the Ogden Raptors and 2012 with the Great Lakes Loons. He hit .280 with 15 homers and 88 RBI in 2013 with the Rancho Cucamonga Quakes of the California League. In 2014 he played with the AA Chattanooga Lookouts of the Southern League, where he hit .269 with 17 homers and 73 RBI and scored an invite to spring training for 2015. He was assigned to the AAA Oklahoma City Dodgers. He appeared in 117 games and hit .262 with 12 homers and 50 RBI. In 2016 he remained with Oklahoma City and hit .328 with 18 homers and 64 RBIs in 101 games. Farmer graduated from the Marist School in Atlanta, Georgia, where he played baseball and football. While at Marist, he made a cameo appearance as the high school quarterback in the movie The Blind Side. During his collegiate baseball career at the University of Georgia, Farmer played shortstop, hitting for a .308 batting average and recording .968 fielding percentage, a UGA record for the shortstop position. He was drafted by the New York Yankees in the 35th round of the 2012 MLB Draft but did not sign and then was drafted by the Los Angeles Dodgers in the 8th round of the 2013 MLB Draft and signed. He made his professional debut with the Ogden Raptors of the Pioneer League in 2013 and then was promoted to the Great Lakes Loons of the Midwest League in 2014. After 57 games with Great Lakes where he hit .310 he was promoted again to the Rancho Cucamonga Quakes of the California League, where he hit .238 in 36 games. He began 2015 with the Quakes, where he was selected to the mid-season All-Star team. He did not play in the game due to his subsequent promotion to the Double-A Tulsa Drillers of the Texas League. Farmer was selected to represent the Dodgers organization at the All-Star Futures Game in 2015. He played in 76 games for Tulsa and hit .272. He returned to Tulsa to start the 2016 season and was selected to the mid-season all-star game. He played in 74 games for the Drillers in 2016, hitting .256 with five homers and 31 RBI. The Dodgers added him to their 40-man roster after the season. This name uses Spanish naming customs: the first or paternal family name is Fernández and the second or maternal family name is Rojas. Fernandez underwent Tommy John surgery on May 12, 2016, causing him to miss the entire 2016 season. Paul Andrew Hoenecke (/heneki/; born July 8, 1990) is an American professional baseball corner infielder and catcher in the Los Angeles Dodgers organization. Hoenecke played high school baseball at West Bend High School, where he won a state championship and was selected as player of the year two years in a row. He was a star pitcher for West Bend as well as being one of their top run producers. As a junior he set a school record with a .515 batting average and also was 9–1 with a 2.18 earned run average as a pitcher. Hoenecke was drafted by the Detroit Tigers, at the age of 17, in the 42nd round of the 2008 Major League Baseball draft. He was offered a $40,000 signing bonus but did not sign. He attended the University of Wisconsin-Milwaukee to play for the Milwaukee Panthers baseball team in the NCAA Division 1 Horizon League. With the Panthers, Hoenecke played infield and, in his senior year, played catcher. Hoenecke finished four years of play with a .301 batting average in 211 games. He also played for the Green Bay Bullfrogs of the Northwoods League in 2010 and 2011. Hoenecke was drafted by the Los Angeles Dodgers in the 24th round of the 2012 Major League Baseball draft. He made his professional debut on June 21, 2012 with the Arizona League Dodgers. In the game, Hoenecke went four for five with a home run and four RBIs while playing left field against the Arizona League Brewers. He would win the Arizona League batting title with a .382 average and ranked second in the league in OPS (1.064), third in total bases (107) and seventh in RBI (38). He was promoted to the Ogden Raptors of the Pioneer League on August 31 and had two hits in five at-bats over three games. Hoenecke was assigned to the Great Lakes Loons of the Midwest League to begin the 2013 season In a May game, he suffered a lacerated spleen after a collision with Julio Urías and spent most of the rest of the season on the disabled list. In 43 games for the Loons he hit .230 and he returned to the team for the following season. After having previously been primarily a first baseman, Hoenecke played mostly third base in 2014 and he hit .247 with 15 homers and 61 RBI. He also committed 19 errors in 111 games. In 2015, Hoenecke played in a few major league games in spring training but was assigned to the Advanced-Class A Rancho Cucamonga Quakes of the California League to start the season. He spent a week in Double-A with the Tulsa Drillers in April before returning to the Quakes. He had a sixteen game hitting streak for the Quakes in June before it was snapped He had a .295 batting average for the Quakes in 2015, with nine homers and 63 RBI, helping the team win the California League championship. Hoenecke was a MiLB.com Organization All-Star after both the 2014 and 2015 seasons. Hoenecke returned to the Quakes at the start of the 2016 season and was now listed as a catcher. After only a few games, he was promoted to Tulsa where he was selected to the mid-season all-star team. On the season, he was in 54 games combined between Rancho Cucamonga and Tulsa and hit .269 with nine homers and 30 RBI. Paul Hoenecke is from Kewaskum, WI and is the son of Andrew and Shelly Hoenecke. He is a descendant of 18th and 19th century German mathematician, Carl Friedrich Gauss. Gavin Thomas Lux is a professional baseball shortstop for the Los Angeles Dodgers organization. He played high school baseball for Indian Trail High School and Academy in Kenosha, Wisconsin and was selected in the first round of the 2016 Major League Baseball Draft by the Dodgers. His uncle is Augie Schmidt. Lux was one of the top fifty high school prospects heading into the 2016 draft. He won the 2016 Wisconsin baseball Gatorade Player of the Year awards and Holy Rosary Sports Night Male Athlete of the Year Award in high school. He had committed to Arizona State University but was drafted by the Los Angeles Dodgers in the first round, 20th pick, of the 2016 Major League Baseball Draft. Om June 16, 2016, Lux signed with the Dodgers for a $2.31 million signing bonus. The Dodgers assigned him to the Arizona League Dodgers to begin his professional career. At the end of the season he was promoted to the Ogden Raptors of the Pioneer Baseball League. Between the two levels, he played in 56 games with a .296 batting average and 21 RBI. On April 5, 2015 he was traded, along with Carlos Quentin, Cameron Maybin and Matt Wisler to the Atlanta Braves for Craig Kimbrel and Melvin Upton Jr. On July 2, 2015, he was traded to the Los Angeles Dodgers (along with Caleb Dirks) in exchange for an international bonus slot. He split the 2015 season between the Arizona League Dodgers and Ogden Raptors, hitting .331 in 35 games. He was assigned to the Class-A Great Lakes Loons of the Midwest League to start the 2016 season. He hit only .200 in 17 games and was demoted back to Ogden where he hit .231 in 30 games. Rhame was drafted by the Los Angeles Dodgers in the sixth round of the 2013 Major League Baseball Draft. He signed with the Dodgers and made his professional debut with the Ogden Raptors. In 2014, Rhame played for the Great Lakes Loons. He appeared in 51 games and had a 2.01 earned run average (ERA), 90 strikeouts and nine saves over 67 innings. Rhame was assigned to the Rancho Cucamonga Quakes of the California League to start the 2015 season. He was later promoted to the AA Tulsa Drillers, where he was 3–3 with a 3.06 ERA in 39 games. The Dodgers invited him to major league spring training in 2016 and assigned him to the Triple-A Oklahoma City Dodgers to start the season. He was 1–7 with a 3.29 ERA in 54 appearances and recorded seven saves. The Dodgers added him to their 40-man roster after the season. Edwin Gabriel Rios (born April 21, 1994) is an American baseball first baseman and third baseman for the Los Angeles Dodgers organization. Rios was drafted by the Dodgers in the 6th round of the 2015 MLB Draft out of Florida International University. Rios began his professional career with the Arizona League Dodgers in 2015 but was quickly promoted to the Ogden Raptors of the Pioneer Baseball League. He hit .253 in 22 games for the two teams. He began 2016 with the Great Lakes Loons of the Midwest League, hitting .252 with six homers and 13 RBI in 33 games, earning a promotion to the Rancho Cucamonga Quakes of the California League, where he hit .367 with 16 homers and 46 RBI in 42 games. He was promoted again, to the Tulsa Drillers of the Texas League. He was named the Dodgers organizational minor league player of the year for 2016. Jacob L. Scavuzzo (born January 15, 1994) is an American professional baseball outfielder in the Los Angeles Dodgers organization. Scavuzzo was drafted by the Los Angeles Dodgers in the 21st round of the 2012 Major League Baseball Draft out of Villa Park High School in Villa Park, California. He made his professional debut with the Arizona League Dodgers. He played 2013 with the Ogden Raptors, 2014 with Ogden and the Great Lakes Loons and 2015 with Great Lakes and the Rancho Cucamonga Quakes. After the 2015 season he played in the Arizona Fall League, where he won the Bowman Hitting Challenge. To start the 2016 season, he was promoted to the Double-A Tulsa Drillers of the Texas League where he was selected to the mid-season all-star game. In 112 games, he hit .266 with 10 homers and 39 RBI. Jordan Ladon Sheffield (born June 1, 1995) is an American baseball pitcher. He plays college baseball for the Los Angeles Dodgers organization. He played college baseball for Vanderbilt. Sheffield attended Tullahoma High School in his hometown of Tullahoma, Tennessee. Before graduating, it was discovered that he needed Tommy John surgery, which caused him to fall in the draft. He was selected by the Boston Red Sox in the 13th round of the 2013 Major League Baseball draft, but did not sign and chose to attend Vanderbilt University. After sitting out the 2014 season recovering from surgery, Sheffield made 6 starts and 16 relief appearances for Vanderbilt in 2015. In 60 total innings, he would post a 5–2 win–loss record, 2.85 earned run average (ERA), and 55 strikeouts. Sheffield made 16 starts in the 2016 season, and pitched to an 8–6 record, 3.01 ERA, and 113 strikeouts in 101 2⁄3 innings. His brother, Justus, is a pitcher in the New York Yankees organization. William Dills Smith (born March 28, 1995) is an American baseball catcher for the Los Angeles Dodgers organization. He was drafted by the Dodgers in the first round of the 2016 Major League Baseball Draft out of the University of Louisville. Smith signed on July 17, 2016 for a $1.775 million signing bonus. Smith began his professional career with the Ogden Raptors of the Pioneer Baseball League and was then quickly promoted to the Class-A Great Lakes Loons of the Midwest League. He played in seven games for Ogden, 23 for Great Lakes and 25 for the Rancho Cucamonga Quakes of the California League, hitting a combined .246. Dian Toscano Carrera is a Cuban professional baseball outfielder in the Los Angeles Dodgers organization. Prior to joining the Braves, Toscano played in the Cuban National Series for the Naranjas de Villa Clara from 2008 to 2012. He agreed to terms for a major league contract with the Atlanta Braves on December 8, 2014 and officially signed the deal on January 28, 2015. The deal paid Toscano $6 million over four years and includes a $1.2 million signing bonus. Toscano did not arrive in the United States until April 2015. Due to visa problems that were not solved until July, he did not play in games at any level during the season and was limited to workouts at the Braves spring training facility, the ESPN Wide World of Sports Complex. He was traded to the Los Angeles Dodgers on June 30, 2016, along with Bud Norris, a player to be named later (Alec Grosser), and cash, in exchange for minor league pitchers Caleb Dirks and Philip Pfeifer. The Dodgers assigned him to the Rancho Cucamonga Quakes in the California League, where he hit .226 in 58 games. Verdugo attended Sahuaro High School and was drafted in the 2nd round of the 2014 MLB Draft by the Dodgers. In 49 games for the Arizona League Dodgers he hit .347 and was awarded with post-season Arizona League All-Star honors and Baseball America Rookie league all-star honors. He was assigned to the Class-A Great Lakes Loons of the Midwest League to start 2015. He was selected to the post-season all-star team after he hit .295 in 101 games. Verdugo also received a late season promotion to the Advanced-Class A Rancho Cucamonga Quakes of the California League where he played in 23 games and hit .385. He also hit for the cycle in a game against the Lancaster Jethawks on August 27. He was named the organizations minor league player of the year. 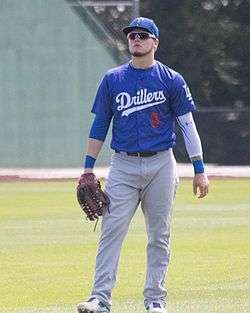 To start the 2016 season, Verdugo was promoted to the Double-A Tulsa Drillers of the Texas League, where he was selected as a starter for the mid-season all-star game and named to the post-season all-star team. He had a .273 batting average in 126 games for the Drillers and hit 13 homers in 63 RBI. He was assigned to the Glendale Desert Dogs of the Arizona Fall League at the conclusion of the season and also played for the Mexico national baseball team in an exhibition series in Japan in November. ↑ McDaniel, Kiley (February 13, 2015). "Yadier Alvarez Emerges While Other Cubans Move Closer to Deals". Fangraphs. Retrieved July 2, 2015. ↑ Townsend, Mark (February 15, 2015). "Meet Yadier Alvarez, baseball's next coveted Cuban prospect". Yahoo Sports. Retrieved July 2, 2015. ↑ Sanchez, Jesse (February 17, 2015). "Acclaimed Cuban free agents highly sought-after". mlb.com. Retrieved July 2, 2015. ↑ Wolf, Paula (February 13, 2015). "New rumor has Phils interested in Cuban pitching phenom". Lancaster Online. Retrieved July 2, 2015. ↑ Gill, Mike (February 13, 2015). "Phillies Interested in Cuban Pitcher Yadier Alvarez". 97.3 ESPN South Jersey. Retrieved July 2, 2015. ↑ Sanchez, Jesse (July 2, 2015). "Dodgers open int'l signing period with a flurry". mlb.com. Retrieved July 2, 2015. ↑ Stephen, Eric (July 2, 2015). "Starling Heredia, Yadier Alvarez, Ronny Brito highlight Day 1 of Dodgers international signing period". SB Nation. Retrieved July 2, 2015. ↑ Minami, Craig (June 21, 2016). "Yadier Alvarez strikes out 7 in debut, Arizona Dodgers take opener 8-7". SB Nation. Retrieved July 3, 2016. ↑ "2016 AZL Dodgers Statistics". Baseball Reference. Retrieved August 7, 2016. ↑ Bernreuter, Hugh (July 21, 2016). "Dodgers' prize prospect Yadier Alvarez dominates in Loons' debut". Mlive.com. Retrieved August 7, 2016. ↑ "2016 Great Lakes Loons Statistics". Baseball Reference. ↑ Adams, Steve (June 12, 2013). "Dodgers Sign First-Rounder Chris Anderson". Mlbtraderumors.com. Retrieved August 31, 2013. ↑ "2010–11 Baseball bio". Judolphins.com. July 29, 1992. Retrieved August 31, 2013. ↑ Barney, Justin. "Dodgers make Chris Anderson first JU baseball player to be drafted in opening round". Jacksonville.com. Retrieved August 31, 2013. ↑ "Los Angeles Dodgers top draft picks Chris Anderson, Tom Windle finally team up for Great Lakes Loons". Mlive.com. June 26, 2013. Retrieved August 31, 2013. 1 2 3 4 5 "Chris Anderson minor league statistics & history". Baseball Reference. ↑ Weisman, Jon (January 9, 2015). "Arruebarrena, Seager, Urias among 17 non-roster Spring Training invitees". dodgers.com. Retrieved January 9, 2015. ↑ Tulsa Drillers (June 15, 2015). "Four Drillers Named All-Stars". milb.com. Retrieved June 15, 2015. ↑ Saxon, Mark (August 25, 2015). "Dodgers looking at two minor-leaguers for bullpen roles". ESPN Los Angeles. Retrieved July 19, 2015. 1 2 Simon, Andrew (January 25, 2016). "Top pitching prospects invited to Dodgers camp". mlb.com. Retrieved January 26, 2016. 1 2 3 4 5 6 7 8 Lewis, Barry (April 4, 2016). "Drillers' roster set for season opener". Tulsaworld.com. Retrieved April 4, 2016. ↑ Laymance, Austin (June 7, 2013). "Dodgers take first baseman Bellinger in fourth round". mlb.com. Retrieved September 19, 2015. 1 2 3 "Clay Bellinger minor league statistics & history". Baseball Reference. 1 2 Dykstra, Sam (June 11, 2015). "Phillips, Reed headline Cal League All-Stars". milb.com. Retrieved June 11, 2015. ↑ California League (August 21, 2015). "Cal League reveals postseason All-Stars". milb.com. Retrieved August 24, 2015. 1 2 Stephen, Eric (November 5, 2016). 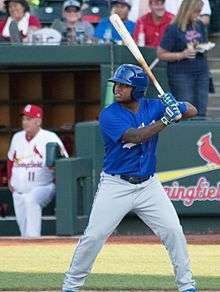 "Willie Calhoun, Cody Bellinger each homer in Fall Stars Game". SB Nation. Retrieved November 6, 2016. ↑ Brudnicki, Alexis (March 29, 2013). "Bellinger Looks To Big League Father For Draft Advice". Baseball America. Retrieved September 19, 2015. ↑ O'Donnell, Matt (June 9, 2013). "Benicia High grad Calhoun taken by Tampa Bay Rays in baseball draft". Time-Herald Sports. Retrieved September 7, 2016. ↑ Gase, Thomas (April 25, 2015). "Benicia High graduate Willie Calhoun putting up big numbers for Yavapai". Times-Herald Sports. Retrieved September 7, 2016. ↑ Gase, Thomas (June 9, 2015). "Benicia High School graduate Willie Calhoun selected by the Dodgers in MLB draft". Time-Herald Sports. Retrieved September 7, 2016. ↑ Dykstra, Sam (July 5, 2015). "Raptors' Calhoun plates career-high five". milb.com. Retrieved September 7, 2016. ↑ Bernreuter, Hugh (August 18, 2015). "Dodgers promote infield prospect Willie Calhoun from Great Lakes". Mlive.com. Retrieved September 7, 2016. 1 2 "Willie Calhoun Register statistics & history". Baseball Reference. 1 2 3 4 5 Stephen, Eric (June 14, 2016). "Alex Verdugo, Willie Calhoun among 9 Texas League All-Stars for Double-A Tulsa". SB Nation. Retrieved June 14, 2016. ↑ Stephen, Eric (June 28, 2016). "Jharel Cotton, Willie Calhoun named to 2016 MLB Futures Game rosters". SB Nation. Retrieved June 28, 2016. 1 2 3 Stephen, Eric (August 31, 2016). "Chase De Jong named Texas League Pitcher of the Year". SB Nation. Retrieved August 31, 2016. ↑ Bernreuter, Hugh (May 28, 2012). "Los Angeles Dodgers prospect Ralston Cash puts career, life back on track with Great Lakes Loons". mlive.com. Retrieved November 2, 2015. ↑ Stephen, Eric (November 2, 2015). "Ralston Cash, manager Bill Haselman named to 2015 AFL Fall Stars Game". SB Nation. Retrieved November 2, 2015. ↑ "Ralston Cash Register Statistics & History". Baseball Reference. ↑ Dakers, Tom (June 5, 2012). "Blue Jays 6th Pick in the 2012 Draft: Chase DeJong". bluebirdbanter.com. Retrieved August 13, 2014. 1 2 3 Elliott, Bob (May 14, 2014). "Blue Jays prospect Chase De Jong following cousin's path". torontosun.com. Retrieved August 13, 2014. 1 2 3 4 5 "Chase De Jong Minor League Statistics & History". Baseball-Reference. Retrieved August 13, 2014. ↑ Weisman, Jon (July 2, 2015). "Dodgers acquire minor-leaguers Chase DeJong and Tim Locastro". Dodgers Insider. Retrieved July 2, 2015. ↑ Norris, Bill (September 17, 2015). "Quakes rout San Jose Giants in Game 1 of Cal League finals". Inland Empire Daily Bulletin. Retrieved September 19, 2015. 1 2 Gurnick, Ken (February 1, 2016). "Dodgers invite 3 RHPs to Spring Training". mlb.com. Retrieved February 1, 2016. ↑ "Chase De Jong Register statistics & history". Baseball Reference. 1 2 3 Gurnick, Ken (November 18, 2016). "De Jong among 3 added to Dodgers' 40-man roster". mlb.com. Retrieved November 19, 2016. ↑ "Cuban Outfielder Yusniel Diaz Free To Sign - BaseballAmerica.com". Retrieved November 19, 2016. ↑ "Yusniel Efraín Díaz: Un novato sin distinción". Retrieved November 19, 2016. ↑ "Dodgers sign pair of Cuban prospects". Retrieved November 19, 2016. ↑ Walton, Ryan (April 4, 2016). "Rancho Cucamonga opening day roster highlighted by Grant Holmes, Yusniel Diaz". SB Nation. Retrieved April 5, 2016. ↑ "Yusniel Diaz Register Statistics & History". Baseball Reference. 1 2 3 4 5 6 "O'Koyea Dickson minor league statistics & history". Baseball Reference. ↑ Hoornstra, J.P. (April 7, 2015). "Revealed: Opening Day roster for Triple-A Oklahoma City.". LA Daily News. Retrieved April 7, 2015. ↑ Lester, Brian (June 17, 2014). "Once blind-sided, Farmer adjusts to catching". MILB.com. Retrieved April 23, 2016. ↑ Cunningham, Michael (July 12, 2015). "Braves prospect Albies shines with future stars". Atlanta Journal Constitution. Retrieved April 23, 2016. ↑ Clarkson, Roger (February 14, 2013). "Kyle Farmer returns to UGA as world traveler with new respect for baseball". Athens Banner Herald. Retrieved April 23, 2016. ↑ Clarkson, Roger (June 5, 2013). "Kyle Farmer 'ready to play' for whichever MLB team drafts him". Athens Banner Herald. Retrieved April 23, 2016. 1 2 3 "Kyle Farmer Minor & Fall Leagues Statistics & History". Baseball Reference. ↑ Bernreuter, Hugh (June 20, 2014). "Los Angeles Dodgers prospect Kyle Farmer earns promotion". Booth Newspapers. Retrieved April 23, 2016. ↑ Calcaterra, Craig (June 25, 2015). "Futures Game Rosters announced". NBC Sports. Retrieved June 25, 2015. 1 2 "Los Angeles Dodgers to sign Cuban Pablo Millan Fernandez - ESPN Los Angeles". ESPN.com. Retrieved 23 March 2015. ↑ "El lanzador holguinero Pablo Millán Fernández abandona la Isla". Diario de Cuba. Retrieved 23 March 2015. ↑ Plunkett, Bill (May 11, 2015). "Dodgers' Hector Olivera and Pablo Fernandez cleared to travel to U.S.". OC Register. Retrieved May 11, 2015. ↑ Stephen, Eric (May 19, 2015). "Hector Olivera, Pablo Fernandez officially sign with Dodgers". SB Nation. Retrieved May 19, 2015. ↑ "Pablo Fernandez minor league statistics & history". Baseball Reference. ↑ Stephen, Eric (May 12, 2016). "Pablo Fernandez out for the season after Tommy John surgery". SB Nation. Retrieved May 13, 2016. 1 2 3 Schoepp, Trapper. "Catching a Dream". Media Milwaukee. University of Wisconsin-Milwaukee. Retrieved 6 February 2016. ↑ Boehler, Dave (July 27, 2007). "Champions show no mercy". Milwaukee Journal-Sentinel. Retrieved September 7, 2016. ↑ Murphy, Dan (June 20, 2008). "In complete control". Milwaukee Journal-Sentinel. Retrieved September 7, 2016. 1 2 "UWM Baseball Recruit Selected By Detroit Tigers In MLB Draft". CBS College Sports. June 9, 2008. Retrieved September 7, 2016. ↑ "Paul Hoenecke-2012 Baseball". Milwaukee Panther Athletics. Retrieved September 7, 2016. ↑ "Paul Hoenecke Baseball Statistics". Baseball Cube. Retrieved September 7, 2016. ↑ "Three Milwaukee Panthers Drafted in 2012 MLB First-Year Player Draft". Horizon League. June 6, 2012. Retrieved September 7, 2016. ↑ Cervenka, Ron (July 11, 2012). "Down on the Farm – Dodgers Announce June Dodger Pride Award Winners". Retrieved September 7, 2016. ↑ Lennox, Brandon (October 13, 2012). "2012 Arizona Dodgers minor league season in review". SB Nation. Retrieved September 7, 2016. 1 2 "Paul Hoenecke Stats, Highlights, Bio". milb.com. Retrieved September 7, 2016. ↑ "2012 Ogden Raptors Statistics". Baseball Reference. Retrieved September 7, 2016. ↑ Nosler, Dusin (March 31, 2013). "Great Lakes Loons announce 2013 roster, led by prospect Corey Seager". Feelin' Kinda Blue. Retrieved September 7, 2016. ↑ Bernreuter, Hugh (April 12, 2014). "Paul Hoenecke returns to Great Lakes Loons with healthy spleen". Mlive.com. Retrieved September 7, 2016. 1 2 3 4 "Paul Hoenecke Register Statistics & History". Baseball Reference. Retrieved September 7, 2016. ↑ Stephen, Eric (March 31, 2014). "Great Lakes Loons 2014 Opening Day roster". SB Nation. Retrieved September 7, 2016. ↑ Massey, Jared (September 21, 2014). "Dodgers 2014 Minor League Review: Great Lakes Loons". Dodgers Nation. Retrieved September 7, 2016. 1 2 Cummings, Steve (July 15, 2016). "INTERVIEW: PAUL HOENECKE". California League Heat. Retrieved September 7, 2016. ↑ Stephen, Eric (April 7, 2015). "Rancho Cucamonga 2015 preliminary roster highlighted by Jose De Leon, Cody Bellinger". SB Nation. Retrieved September 7, 2016. ↑ Cervenka, Ron (April 19, 2015). "Quakes third baseman Paul Hoenecke promoted to Double-A Tulsa". Think Blue LA. Retrieved September 7, 2016. ↑ Cervenka, Ron (July 2, 2015). "Quakes Paul Hoenecke sees hitting streak end at 16". Think Blue LA. Retrieved September 7, 2016. ↑ Alfano, George (September 17, 2015). "CAL LEAGUE: Quakes thump Giants in finals opener". The Press Enterprise. Retrieved September 7, 2016. ↑ Walton, Ryan (April 4, 2016). "Rancho Cucamonga opening day roster highlighted by Grant Holmes, Yusniel Diaz". SB Nation. Retrieved September 7, 2016. ↑ Lewis, Barry (May 13, 2016). 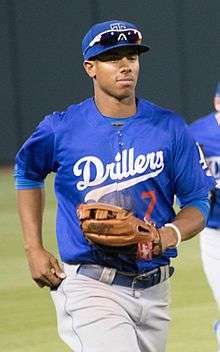 "Paul Hoenecke powers Drillers to 7-2 win over Travelers". Tulsa World. Retrieved September 7, 2016. ↑ Lewis, Barry (June 28, 2016). "Texas League All-Star Game filled with Drillers". Tulsa World. Retrieved September 7, 2016. ↑ Menaker, Elise (February 2, 2016). "Kenosha baseball player considered Top 50 HS draft prospect". WTMJ-TV Milwaukee. Retrieved June 4, 2016. ↑ USA TODAY High School Sports (May 24, 2016). "2015-16 Gatorade State Baseball Players of the Year". usatodayhss.com/. Retrieved June 9, 2016. ↑ Johnson, Mike (January 16, 2016). "Indian Trail's Lux a baseball star deluxe". Kenosha News. Retrieved June 4, 2016. ↑ Boehler, Dave (March 30, 2016). "Future looks bright for Indian Trail's Gavin Lux". Milwaukee, Wisconsin Journal Sentinel. Retrieved June 3, 2016. ↑ Van Vooren, Tim (May 16, 2016). "For Kenosha Indian Trail baseball player, it's ASU or the pros next year: "Either way, a win-win"". Fox 6 News. Retrieved June 4, 2016. ↑ Gurnick, Ken (June 16, 2016). "Dodgers ink first-round Draft pick Lux". mlb.com. Retrieved June 16, 2016. ↑ Kenosha News Staff (June 28, 2016). "Local briefs: Lux collects first multi-hit game". Kenosha News. Retrieved July 3, 2016. ↑ Grennel, Michael (August 31, 2016). "Dodgers' first round pick Gavin Lux joins Ogden Raptors for homestand". Standard-Examiner. Retrieved August 31, 2016. ↑ "Gavin Lux Register statistics & history". Baseball Reference. ↑ "Serra's Jordan Paroubeck drafted by San Diego Padres". mercurynews.com. Retrieved May 5, 2015. ↑ "Paroubeck picks Padres over college". mercurynews.com. Retrieved May 5, 2015. ↑ Jeff Sanders. "Finally, Paroubeck off to strong start". U-T San Diego. Retrieved May 5, 2015. ↑ "Braves deal Kimbrel, Upton to Padres in blockbuster deal". San Diego Padres. Retrieved May 5, 2015. ↑ Bowman, Mark (July 2, 2015). "Braves make 2 trades for bonus pool money". MLB.com. Retrieved July 3, 2015. 1 2 "Jordan Paroubeck minor league statistics & history". Baseball Reference. ↑ Stephen, Eric (April 3, 2016). "Great Lakes Loons opening day roster highlighted by Brendon Davis, Omar Estevez". SB Nation. Retrieved April 5, 2016. ↑ Boedeker, Adam (July 27, 2010). "Denton Guyer pitcher Jacob Rhame commits to Oklahoma". Dallas Morning News. Retrieved September 19, 2015. ↑ Bernreuter, Hugh (August 7, 2014). 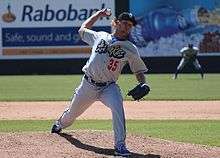 "Los Angeles Dodgers prospect Jacob Rhame brings weight down, strikeouts up". mlive.com. Retrieved September 19, 2015. ↑ Boedecker, Adam (June 7, 2013). "Dodgers select Guyer product Rhame". Denton Record-Chronicle. Retrieved September 19, 2015. ↑ Boedecker, Adam (July 3, 2014). "Guyer-ex Rhame doing well on Dodgers' farm". Denton Record-Chronicle. Retrieved September 19, 2015. 1 2 3 "Jacob Rhame minor league statistics & history". Baseball Reference. ↑ Lindskog, Mike (April 7, 2015). "Quakes Announce Preliminary Roster". milb.com. Retrieved April 7, 2015. ↑ "OKC Dodgers Release 2016 Opening Day Roster". news9.com. April 6, 2016. Retrieved April 7, 2016. ↑ Stephen, Eric (September 2, 2016). "Brock Stewart, Edwin Rios named Dodgers minor league pitcher, player of the year". SB Nation. Retrieved September 2, 2016. 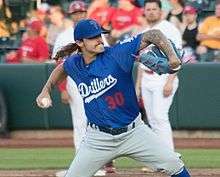 ↑ "Los Angeles Dodgers' Jacob Scavuzzo uncovering his power with Ogden Raptors - MiLB.com News - The Official Site of Minor League Baseball". Retrieved November 19, 2016. ↑ "Jacob Scavuzzo wins Bowman Hitting Challenge". Retrieved November 19, 2016. ↑ "Jacob Scavuzzo Register Statistics & History". Baseball Reference. ↑ Gleeman, Aaron (April 11, 2013). "Gary Sheffield's nephew, draft prospect Jordan Sheffield, needs Tommy John surgery". nbcsports.com. Retrieved June 9, 2016. 1 2 "Jordan Sheffield Baseball Statistics". thebaseballcube.com. Retrieved June 9, 2016. ↑ "MLB 2016 Prospect Watch". MLB.com. Retrieved June 9, 2016. ↑ Gurnick, Ken (June 10, 2016). "Dodgers pick Vanderbilt right-hander at No. 36". Dodgers.com. Retrieved June 13, 2016. ↑ "Instagram photo by Jordan Sheffield • Jun 25, 2016 at 9:45pm UTC". Retrieved November 19, 2016. ↑ "Jordan Sheffield Register Statistics & History". Baseball Reference. ↑ "Five questions with Indians' Justus Sheffield". mlb.com. Retrieved 31 July 2016. ↑ "Who is Justus Sheffield? Yankees get pitcher in Andrew Miller trade to Indians". nj.com. Retrieved 2 August 2016. ↑ "Stock surges for U of L catcher Smith". Retrieved November 19, 2016. ↑ Hoornstra, J.P. (June 9, 2016). "Dodgers use 32nd overall pick on college catcher Will Smith.". Los Angeles Daily News. Retrieved June 9, 2016. ↑ Stephen, Eric (June 18, 2016). "2016 MLB Draft: Dodgers reportedly sign catcher Will Smith, No. 32 overall pick". SB Nation. Retrieved June 18, 2016. ↑ Leboff, Michael (June 30, 2016). "Dodgers' Smith smacks first pro homer". milb.com. Retrieved July 3, 2016. ↑ Bernreuter, Hugh (July 2, 2016). "First-round draft pick Will Smith leads Loons to win in first game". Mlive.com. Retrieved July 3, 2016. ↑ "Will Smith Register Statistics & History". Baseball Reference. ↑ Badler, Ben (December 8, 2014). "Cuban Outfielder Dian Toscano Agrees To Sign With Braves". Baseball America. Retrieved November 7, 2015. ↑ O'Brien, David (December 8, 2014). "Braves agree to terms with Cuban outfielder". Atlanta Journal Constitution. Retrieved November 7, 2015. ↑ Bowman, Mark (January 28, 2015). "Braves announce 4-year deal with Toscano". MLB.com. Retrieved November 7, 2015. ↑ "Dian Toscano, Braves agree to deal". ESPN.com. Associated Press. January 28, 2015. Retrieved November 7, 2015. ↑ Stephenson, Craig (April 8, 2015). "Atlanta Braves outfielder Dian Toscano, Cuban defector, finally arrives in Florida". Huntsville Times. Retrieved November 8, 2015. ↑ Bowman, Mark (April 8, 2015). "Cuban outfielder Toscano arrives in Florida". MLB.com. Retrieved November 8, 2015. ↑ Bowman, Mark (November 7, 2015). "Toscano cleared to play, but where is unknown". MLB.com. Retrieved November 7, 2015. ↑ Gurnick, Ken (June 30, 2016). "Dodgers acquire righty Norris from Braves". mlb.com. Retrieved June 30, 2016. ↑ "Dian Toscano Register Statistics & History". Baseball Reference. 1 2 3 "Alex Verdugo minor league statistics & history". Baseball Reference. ↑ Bernreuter, Hugh (April 6, 2015). "Los Angeles Dodgers send top draft picks Grant Holmes, Alex Verdugo to Great Lakes Loons". Mlive.com. Retrieved April 7, 2015. ↑ Dykstra, Sam (August 24, 2015). "McBroom, Torres highlight MWL All-Stars". milb.com. Retrieved August 24, 2015. ↑ Morales, Andy (August 15, 2015). "Dodgers promote Alex Verdugo to the Rancho Cucamonga Quakes". Allsportstucson.com. Retrieved September 19, 2015. ↑ Rosenbaum, Mike (August 27, 2015). "Verdugo hits for the cycle for Class A Advanced Rancho Cucamonga". mlb.com. Retrieved September 19, 2015. ↑ Stephen, Eric (October 1, 2015). "Alex Verdugo, Zach Lee named Dodgers 2015 minor league player, pitcher of year". SB Nation. Retrieved October 1, 2015. ↑ "Alex Verdugo Register Statistics & History". Baseball Reference. ↑ Stephen, Eric (November 5, 2016). "Alex Verdugo to join Team Mexico for exhibition in Japan". SB Nation. Retrieved November 6, 2016.